It integrates live TV channels and multiple input devices. Sure, you can get a Fire TV stick with an Alexa remote and plug it into your existing television set to make it smart. But that setup can't pull in streams from all the devices you have connected, like your PlayStation, antenna and whatever else you have stuck in your HDMI ports. Nor can it integrate all those inputs seamlessly into the OS. But if a central hub for all of your streaming content is important to you, and if you have money just laying around, consider the new Element Fire TV Edition. It's the first television with Fire TV OS built in, thanks to a collaboration between Amazon and TV maker Element. Starting at $449 for a 43-inch version, the Edition adds a few conveniences to the existing interface that you won't get with only the stick. 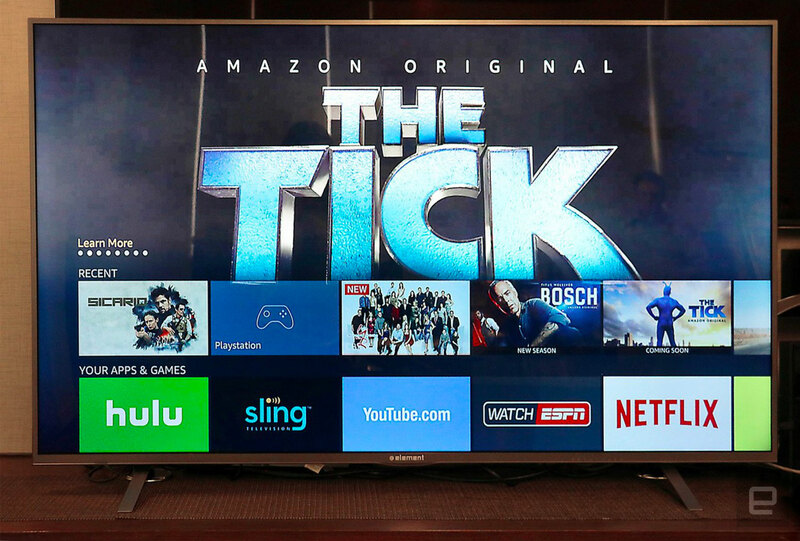 First, since this system is integrated natively, it can detect the devices you've hooked up to your TV and display them in what Amazon calls a content row. That's the row of thumbnails you'll see representing each TV show or, in this case, input device on the home page. This layout makes it easy to see what you have playing on each satellite device, and it lets you quickly jump back into what you were watching before. During my demo, there was no lag during playback, and Element's rep was able to jump between input channels smoothly. Another difference between the Edition and a Fire TV stick is the former's ability to manage live content. With an HD antenna, you can pull broadcasts into the OS and see what's streaming without having to leave the home page. Live channels show up as another content row, and you can see what's on the air. A progress bar also indicates how long each particular show has been playing and how much of each is left. As you are watching something live, you can also pause playback for up to 90 seconds and rewind to pick up where you left off. That 90-second window can be expanded if you pop in an SD card, but it's not clear how much extra time you gain. Amazon also baked in a channel-guide interface that lets you view up to 14 days of live programming information. You can favorite specific channels and filter the table to only show your preferred outlets. And because it's an Amazon device, you can also summon Alexa to help you find your favorite show, no matter where it's playing. Say, for instance, you want to watch Empire. Tell Alexa, "Play Empire," and it will find a version that you have access to, whether it's streaming on Hulu or broadcasting on Fox. This is particularly helpful when there's a movie you'd like to stream but don't want to shell out for it. Alexa can look up versions available now, but it will also show you when that title is next playing for free on TV, so you can set yourself a reminder to watch it then. Like on the Fire TV stick, Alexa can also control your smart home devices, like your Philips Hue lights or thermostat. Amazon has also tailored the interface to display visual aids when you're interacting with Alexa on the TV so you can see restaurant ratings and reviews when you look up the best dining locations around you. Unfortunately, you'll have to press a button on the Fire TV remote to talk to Alexa, as the Edition will not be always listening for the wake word. Those who are more security conscious may find this a blessing, but people who want the convenience of not having to speak into a remote control to use a voice assistant will be disappointed. Everything I described worked smoothly during my brief time with a 65-inch unit of the Edition, which also comes in 50- and 55-inch models. All options are 4K, and based on the vibrance and clarity of my demo unit, the TVs are bright and colorful enough to do your favorite movies justice. Of course, the quality doesn't compare to the high-end OLED sets from Samsung and LG, which have more stunning and saturated images. The Edition's onboard speakers provided ample volume for both on-screen dialogue and music playback too. In the meeting room we were in, though, the overhead lights were frequently reflected by the screen, causing a glare in some spots and also making it extremely difficult to take a nice picture of the Edition. The TVs are available with Element or Westinghouse branding, with no difference in price between the two, since they are, well, the same company. Aside from the logos below the screens, the devices from both labels will be identical. Prices start at $449 (for the 43-inch model) and increase to $549 (for the 50-inch), $649 (for the 55-inch) and $899 (for the 65-inch). Those who pre-order on Amazon starting today will also get an AmazonBasics indoor HD TV antenna -- all the better to make use of those new live TV features with, right? 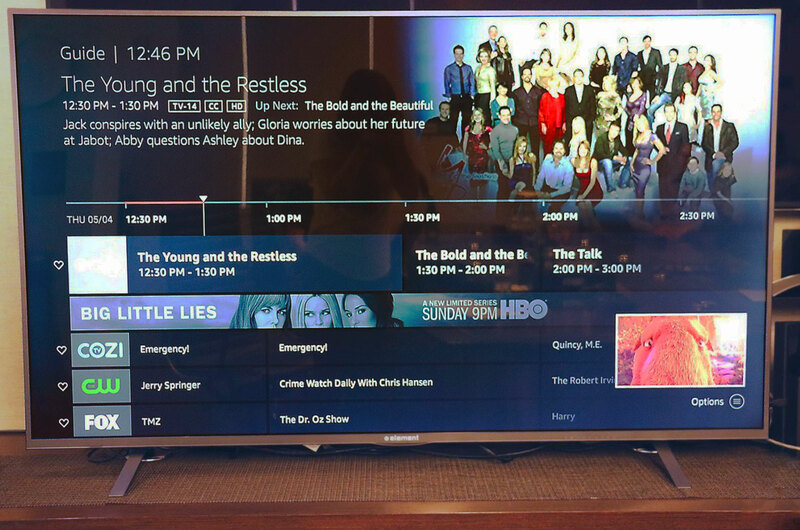 In my short time trying it out, Amazon and Element's collaboration appears well-executed, but whether consumers are willing to buy the Edition for its live TV and input integration features over more-established (or cheaper) TV sets is another question altogether.